Data loss on the internal hard drive is a quite often issue among home computer users. You could accidentally delete some important files from the drive, or the internal drive has been used as a boot drive and suddenly Windows failed to boot correctly. If the drive isn't damaged mechanically, the chance to recover data from it successfully is high. do not install any software on the drive you need to recover data from. If Windows is installed on that drive, shut down the computer and stop using it. Getting access to the drive with the lost data. If Windows works OK and the internal hard disk is not a boot device. You do not need any special access to the drive but to be an administrator on the computer. If Windows does not start, or if the lost data is on the drive where Windows is installed. You need to remove the hard drive from the PC motherboard and connect it to another computer using either a special SATA cable or an USB enclosure. Preparing enough free disk space on the good storage to hold the recovered data. Using data recovery software like ReclaiMe File Recovery. 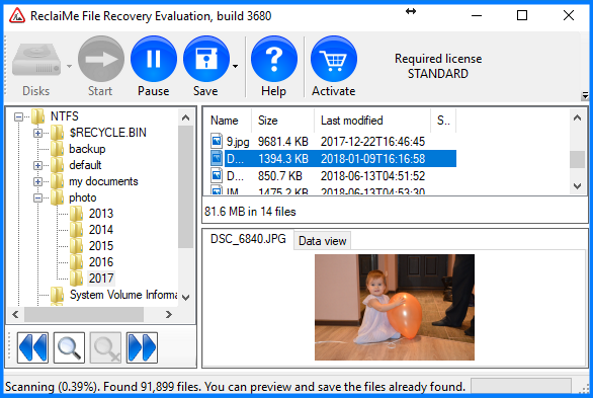 Download and install ReclaiMe File Recovery software. Important: never install software on the drive from which you are going to recover data. Once you selected your hard drive from the device list, click Start to begin data recovery. Check the quality of the recovery using the Preview function. Click Save to copy the recovered data. Important: never save files onto the same drive you are recovering these files from.